For the ninth time in ten years, Amtrak has broken its ridership record, transporting 31.2 million passengers between September 30, 2011 and September 30, 2012. This is a great sign that the use of affordable, sustainable transportation is steadily rising. Ridership on Amtrak trains grew 3.5% in 2012, the highest number of passenger trips since the start of the company in 1971. Since 2000, Amtrak ridership has grown a total of 49%. Ticket revenue has also increased by about 6%, and Amtrak has had almost $100 million more in sales than anticipated for the 2012 budget. It’s an interesting time of year to see these numbers come out, with the government subsidies given to Amtrak a big part of policy debate this election season. The subsidies reached about $466 million, plus an extra $952 million for capital expenses. A lot of this is likely due to the increasing hassle of air travel, especially when it can take over an hour to get through a TSA line and cost $50 to check 2 bags that still have weight restrictions. Part of Amtrak’s future investments are in new Acela trains, which travel up to 160 miles per hour. If you’re traveling along the east or west coast, throughout the Midwest, or only crossing one state border, that’s much more convenient than dealing with the cost and stress of an airport or the high cost of fuel for your car. Plus, taking the train can be fun and relaxing, and the seats are far more comfortable than coach on many flights. 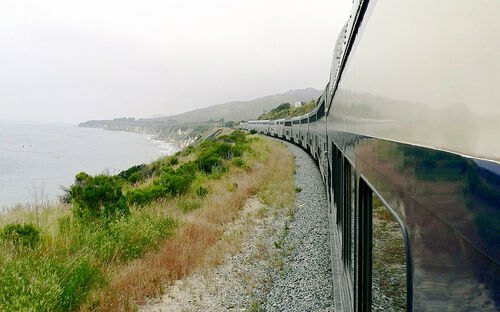 Have you taken an Amtrak train recently? Do you prefer it over flying and/or driving?